President Donald Trump on Thursday again called for arming qualified teachers as a way to prevent school shootings. 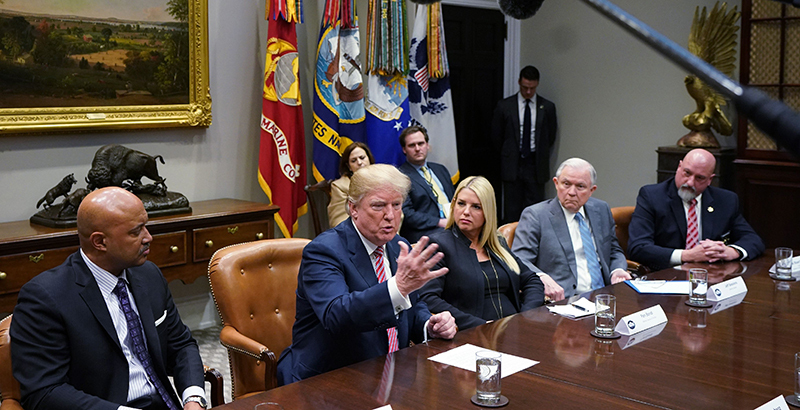 The president first discussed the idea Wednesday afternoon at a meeting with survivors of the Valentine’s Day shooting at Marjory Stoneman Douglas High School in Parkland, Florida, that killed 14 students and three teachers. Advocates of such a plan have argued that qualified educators could more quickly respond to a shooting than waiting for police. “I want certain highly adept people, people that understand weaponry, guns, if they really have that aptitude, because not everybody has an aptitude for a gun, I think a concealed permit for teachers and letting people know there are people in the building with a gun, you won’t have, in my opinion, you won’t have these shootings,” Trump said at a meeting Thursday with state and local officials, according to a press pool report. The Council of Chief State School Officers, which represents state education secretaries, will establish a working group to address school safety, the group announced Thursday. “This work will not be easy. We understand that school safety sits at the intersection of many complicated issues involving mental health, student privacy, resources and gun laws, but as state chiefs we welcome the difficult conversations that will move us forward in making schools safer for every child,” Carissa Moffat Miller, the group’s interim executive director, said in a statement. The president also suggested “a little bit of a bonus” for educators who carry weapons. Wednesday he said 20 percent of educators might be qualified to carry weapons at school; Thursday he suggested 10, 20, or 40 percent of teachers might fit the bill. Other than mentioning teachers who might be ex-military, Trump did not specify what those qualifications might be. The idea has been generally panned by educators. National Education Association president Lily Eskelsen García in a statement Wednesday said parents and teachers “overwhelmingly” oppose arming educators. “Educators need to be focused on teaching our students. We need solutions that will keep guns out of the hands of those who want to use them to massacre innocent children and educators. Arming teachers does nothing to prevent that,” she said. Nate Bowling, Washington’s 2016 Teacher of the Year, said on Twitter the list of things he’d rather have at school than guns “is very long and begins with a well-functioning copier.” Other teachers said they’d prefer everything from basics like tissues, tape, and paper to more special education teachers and guidance counselors. Other teachers on Twitter used the hashtag #ArmMeWith to ask for everything from additional mental health supports for students to more diverse books. The idea of arming educators leaves a host of questions unresolved, from who would pay for the firearms, to how and where the weapons would be stored during the school day, to what the consequences would be if armed teachers accidentally shoot students. Trump also said he’d be willing to provide federal money for training educators. The administration’s proposed fiscal 2019 budget asked for cuts to federal school safety grants, including eliminating $25 million in grants to schools where students experience pervasive violence, and asking for no new money for federal grants that help schools that have experienced large-scale violent events, though that grant program has carry-over funds from previous years, Politico reported. Trump also expressed distaste for the idea of mandated active shooter drills, raised in the meeting by Florida Education Commissioner Pam Stewart — which in some recent cases have been credited with saving children’s lives. “Active shooter drills is a very negative thing… I don’t like it. I’d much rather have a hardened school… I think it’s crazy. I think it’s very hard on children,” Trump said. The president said he “wouldn’t want to tell my son that you’re going to participate in an active shooter drill.” Trump’s youngest child, 11-year-old Barron, attends a private school in Potomac, Maryland. Maryland requires schools to conduct annual drills for practices associated with active shooters — such as lockdowns, evacuations, and sheltering in place — but those requirements appear to apply only to public schools.